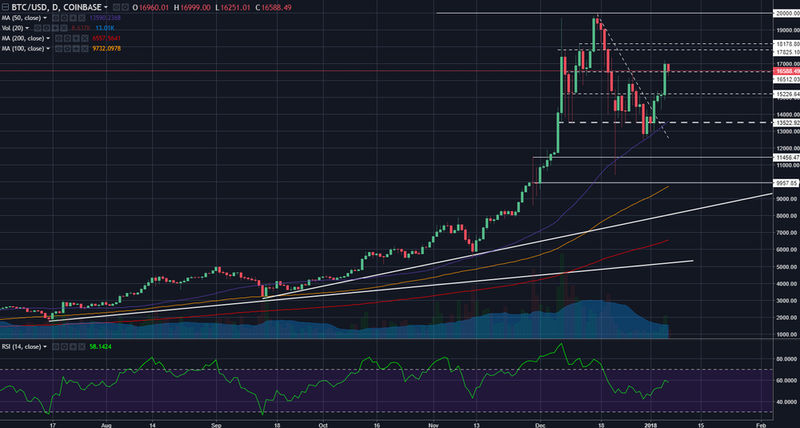 Bitcoin (BTC/USD) has been consolidating since December. But looking at the daily chart, it looks like bulls are back in control. We can see that price came up to 20K twice and retreated both times. You can say that's a double top, but sometimes it simply means consolidation under 20K. For me, there are main technical signals that suggest bulls are going to push BTC/USD to 20K again, with the prospect of breaking higher. 1) Price held above the 200-, 100-, and 50-day simple moving averages (SMAs). 2) The RSI held above 40. 3) Price action is strong, and broke 16K. At this point, if price can hold above 15K, I would gain more confidence that bulls are in control. By the end of January, don't be surprised if BTC/USD is on the other side of the 20K resistance.